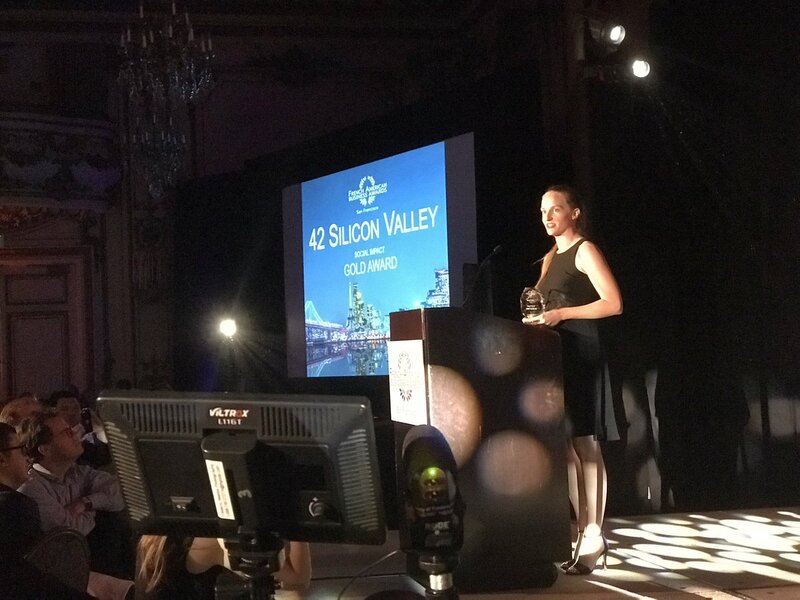 42 Silicon Valley was awarded the Gold Award in the Social Impact category for its innovative work in education at the French American Business Awards in San Francisco. 42 Silicon Valley was awarded the Gold Award in the Social Impact category for its innovative work in education at the French American Business Awards last week. Over the last year, 42 has been working to bring opportunities to America’s youth through industry-leading, quality programming education at no cost to students. The campus follows from that founded in Paris by co-founders Kwame Yamgnane, Xavier Niel, Nicolas Sadirac, and Florian Bucher. FABA brings together leading entrepreneurs, executives, and businesses in the San Francisco area to honor annual results and lasting performance in management and leadership in various categories and is sponsored by companies such as Salesforce, AirFrance, Orange, and more. FABA are split into 11 categories including US investment in France, Wine, Social Impact, and Woman Role Models. Notable nominees included Tesla, Cisco, Facebook France, GE, Docker, Upwork, and SmartRecruiters, Inc.
42 Silicon Valley was recognized for its innovative higher education model that removes traditional barriers to high quality education and offers the opportunity for social advancement to those who cannot afford an Ivy League education. 42 does not charge tuition and does not have admissions requirements yet provides a rigorous programming education, meaning that industry-leading programming education is open to anyone aged 18-30 based solely on merit. Resembling somewhat the American dream, the 42 program is funded by French billionaire Xavier Niel: it is as if every student at 42 gets a $50,000 scholarship regardless of their background or qualifications. With a rigorous coding education in their pocket, students move into jobs at leading Silicon Valley and S&P 500 companies, startups, and more. 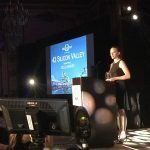 “We’re honored to receive this award, and we’re grateful for the French American business community here in the Bay Area,” said Brittany Bir, COO of 42 Silicon Valley who received the award last week. “It’s been a good first year, but we’re just getting started. Our goal is to double our scale: firstly, to bring needed and skilled top tech talent to Silicon Valley and become a hub of innovation, and secondly, and more importantly, to provide the opportunity to receive an industry-leading computer programming education to those who would not otherwise have the resources for such an education,” said Bir. 42 Silicon Valley is an innovative coding college producing the next generation of software engineers and programmers. With no teachers, courses, professors, lectures, or classes, 42 is disrupting the higher education model using project-based and peer-to-peer learning with gamification to develop students with real-world skills ready for the workplace. Funded by French billionaire Xavier Niel, 42 is committed to open opportunities for students, excellence in learning, innovation, and a strong student community. Learn more at www.42.us.org.